Come on down to the Fries ballpark to celebrate the Fourth of July! Parade lineup begins at 10:00 a.m. at the old mill site. Parade will begin at 11:00 a.m. Activities in the ballpark begin immediately after the parade. 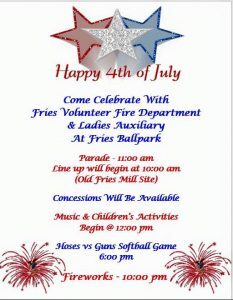 Activities include children’s games, music, an old-timers, guns, and hoses softball game. Fireworks will be at 10:00 p.m. at the ballpark! Admission is $1.00, kids 5 and under are free! No cost to play games. Concessions will be available.